An international team of astronomers led by Dan Bayliss of the Observatory of the University of Geneva and member of PlanetS discovered a brown dwarf, an object that is neither a star nor a planet, with a density never seen before. Ten times denser than gold! The measured density of the brown dwarf EPIC201702477b is the highest ever measured for an object other than stellar remnants (white dwarfs and neutron stars for example). A brown dwarf is an insufficiently massive object for the thermonuclear reactions of hydrogen to set off as for stars, while being more massive than a giant planet. Astronomers estimate that the mass of brown dwarfs is between 13 and 80 times the mass of Jupiter. Most brown dwarfs “float” in space like stars because they have formed like stars by the gravitational collapse of a cloud of gas. As they produce very little light, it is difficult to observe them and even more to determine their characteristics such as their mass and their radius and consequently their density. Only theoretical models can give a rough idea. 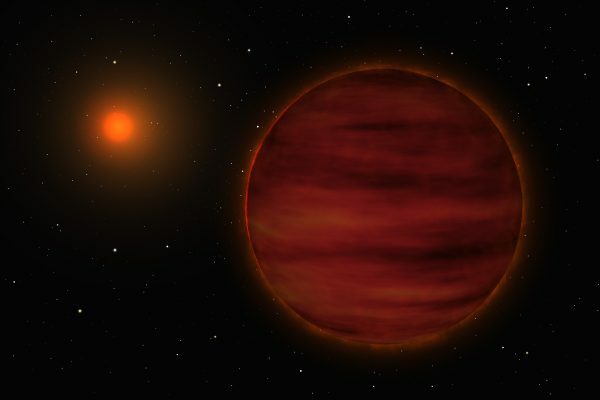 Artist’s impression of a brown dwarf and its star (credit ESO). There are, however, some rare cases where the brown dwarf is orbiting a star like a planet. In these cases it is possible to determine their mass thanks to the method of radial velocities, and measure its diameter if it passes in front of its star causing a mini eclipse (called transit). These brown dwarfs are rare and it is still difficult to explain how such massive objects can be formed. By measuring the mass of an object discovered by the Kepler satellite as it provoked a transit, Dan Bayliss and his team realized that it was a brown dwarf 80 times more massive than Jupiter, namely just at the border between the brown dwarfs and the stars. According to Kepler’s data, this object has roughly 8 times the radius of Earth which makes it the object with the most dense non-stellar-remnant known to date, about 190kg per dm3, which is 10 times denser than gold! EPIC201702477b is a very interesting object as it allows to better constrain the models of formation of brown dwarfs, and to confirm the mass limit to which a star lights up.